Yesterday was Mountain SOL Tuesday for the MLA campers! Every Tuesday, everyone gets to go on an outside adventure with Mountain SOL. This week, our theme was “Rock Around the Clock,” so we made a sundial! The 5-6s went with Katie and Liz to Birch Crossing, where we collected rocks. 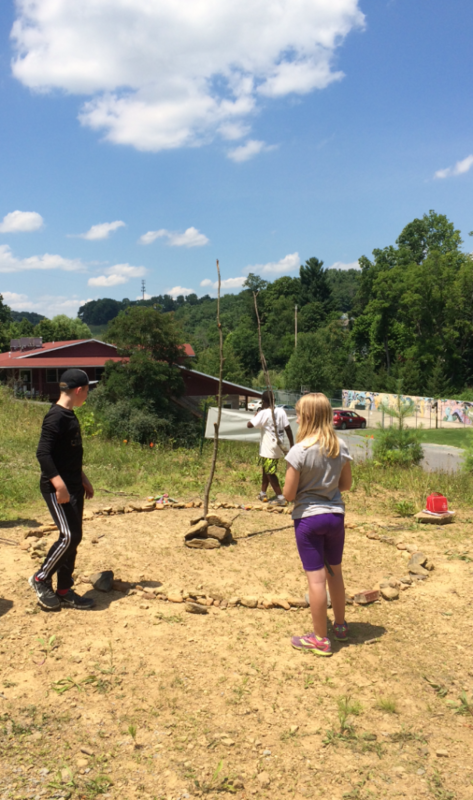 We hiked behind the Mountain SOL sign, where we held hands in a circle to make an outline for our sundial circle. Then we placed rocks where we were standing. The pre-K class went out next. 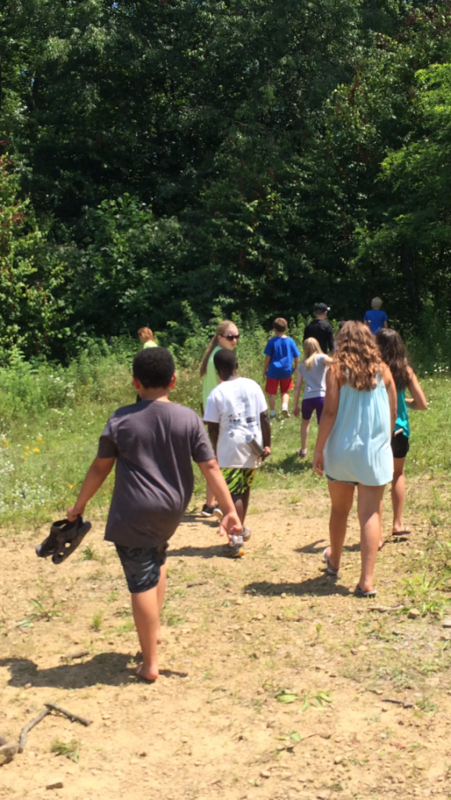 After looking at the garden, we walked to First Crossing, collected rocks, and added them to the circl e.
After lunch, the 7-8s went with Katie and Maya to the Outdoor Classroom to collect rocks they had painted last Mountain SOL Tuesday. Then we went to Birch Crossing, collected rocks there, and took them, along with some painted rocks, back up to the sundial. We added our rocks and completed the circle, also transforming it from a lima bean to a lovely circle. We also put a stick in the middle, so that its shadow would make a hand for our clock. Then we followed the shadow to the edge of the circle, where we marked 1:00 with a painted rock. The 9-11 class went out last. 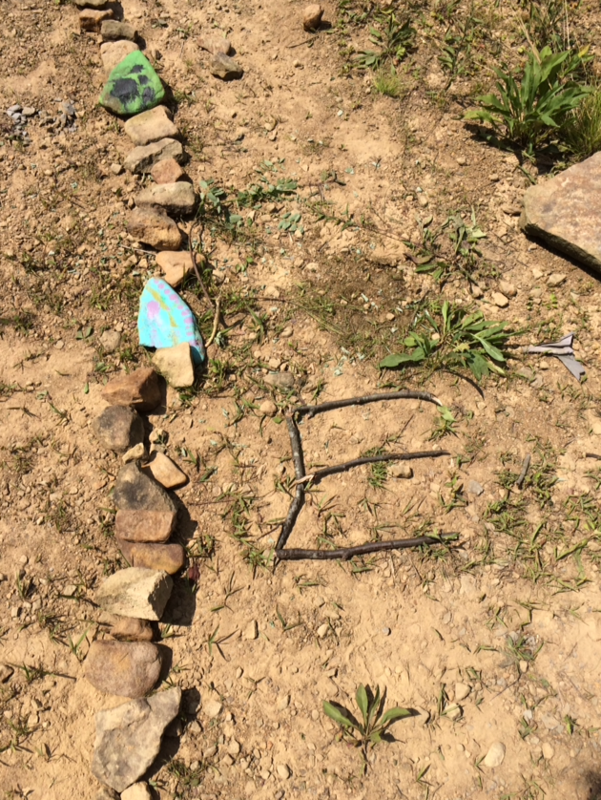 We added some rocks to the sundial circle, and we found a bigger, straighter stick for the hand. We added a painted rock marker for 2:00, and we also added markers for the cardinal directions by arranging sticks in ways that made N, S, E, and W. By the time we were done, we had a beautiful natural clock that you can actually tell time with! If you want to check out the sundial, it’s right behind the Mountain SOL sign (on the flat part of the hill above the corner of the gravel parking lot). It’s pretty cool!